Last month we met with psychoanalyst, poet and writer Valerie Sinason to reflect on our project Obscure Secure as part of our a-n Re:view bursary. It was exactly two years ago (2013) that we met Valerie for the first time, at the beginning of our project. The second time we met her she was in conversation with Frances Spalding as part of our Obscure Secure programme of talks at Christchurch Mansion in November 2014.This means we have met her at key stages of our collaborative project’s development and our individual development as artists (three meetings in total). Our meeting with Valerie Sinason took place last month, we used it to reflect on what we had achieved with Obscure Secure. 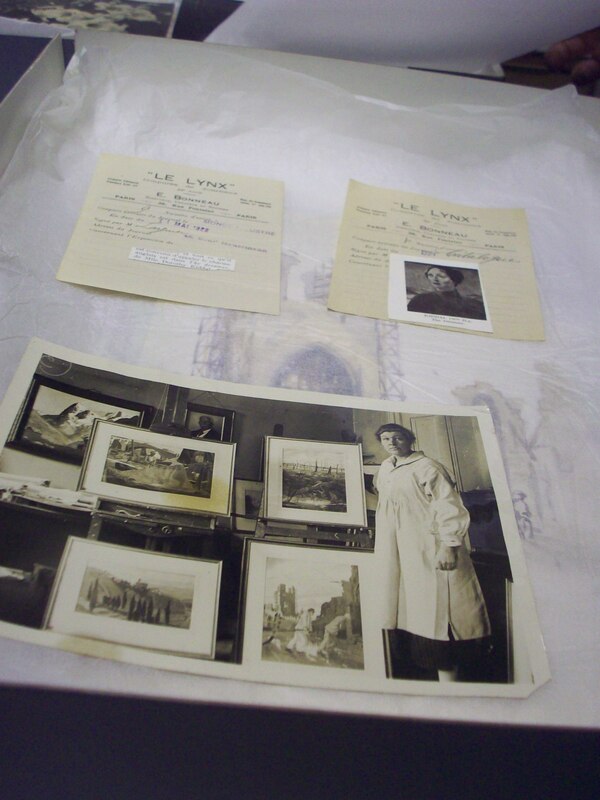 We explored the complexities we had experienced working with a collection and archives. Valerie reflected on our thoughts from a psychoanalytical viewpoint alongside contributing her own creative thinking as a writer and poet. We were particularly interested as artists in ideas around collections, archives and research and how they are able to resurrect women artists lives and works momentarily rather than demonstrating a kind of ancestral worship. Our conversation regularly touched on concepts such as ‘permission, responsibility, gender, power structures and collaborations’. We reflected with Valerie on how artists from collections may also play a role as catalysts for our own projections and new paintings/work. The meeting investigated thinking processes; how our project had developed organically and the learning that had taken place as we proceeded. Valerie highlighted that we have gained knowledge as well as authority and ownership from our project Obscure Secure. There was no formal methodology while researching for Obscure Secure – while we are keen to continue to be open to uncertainty and chance to develop our new project we have gained experience and expect a new methodology and structure to evolve whilst further clarifying our focus during the course of our Re:view bursary meetings and critiques. Our meeting with Valerie lasted two hours and we recorded this discussion. We are so pleased to have a record of this conversation as it has proved to be a vital resource for now and later. Our next Re:view critique and meeting is in September with Martha Flemming , artist and Director of University of Reading’s Collections Based Research Programme.